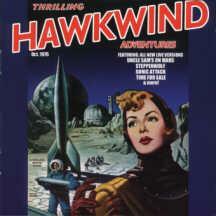 Hawkwind - "Thrilling Hawkwind Adventures"
The so-called Atomhenge UK tour that Hawkwind undertook in the Fall of 1976 to support the 'Astounding Sounds, Amazing Music' LP was (until now) one of the very few major Hawkwind tours not officially archived on CD. 'Thrilling Hawkwind Adventures' solves that deficiency, and looks to be duplicated with a separate 2xCD release upcoming on Voiceprint (UK). Of course, the date and venue given in the CD booklet is (as I've been assured by the experts) erroneous and the source tape is not Hammersmith Odeon (Oct. 5, 1976) but rather Bristol - Colston Hall (Sept. 27, 1976). What else is new? Everything else about the 8-page booklet (lovingly prepared by Rob Godwin) is fabulous, including rare photos of the ASAM lineup, Liquid Len's Atomhenge stage set, and cool artwork in the same pulp Sci-Fi theme as on the old album jacket. But the best thing is that it documents over 50 minutes of a great performance by a band still in its prime, belying what was to occur just months later with the sacking of half the band. In the second half, "Uncle Sam's on Mars" is presented in a fashion quite different than what appeared later on 'PXR5,' here being rather more close to the krautrock-motorized rhythm of "Opa-Loka." "Uncle Sam" segues directly into the 10-minute "Time for Sale," an interesting (previously unreleased) track that undoubtedly belongs with the other ASAM material with its too-oft-maligned "funk blanga" sound that Rudolph and Alan Powell brought. And were sacked for. Personally, I love it. Another non-album track "Back on the Streets" follows, and the seven-piece unit really rocks out here. Finally, THA wraps up as strangely as it began with an especially-freakish version of Moorcock's "Sonic Attack." Do Not Panic! Well, it's not hard to figure out that Griffin has come across with another wonderful package that's head-and-shoulders above the initial trio of Voiceprint (Collector's Series) efforts. The sound quality is rather impressive given it's been sitting around for almost 25 years, though at times some vocals and instruments (esp. Nik's sax) are half-buried in the mix. But overall, I'd even rate this one above the recent 2xCD '1999 Party' package recorded in 1974. I think it's unfortunate that 1976 Hawkwind doesn't get more recognition for producing the amazing and unique space rock that it did - people only seem to remember the internal strife it caused and then transfer that negativity to the music. Hopefully, this album will give Hawkfans a chance to re-evaluate their opinions of that brief but productive era, for the better I mean. A must have!